-Stick a shimmy in to space them out. "You just see their eyes go dead as they retreat into their own brain." 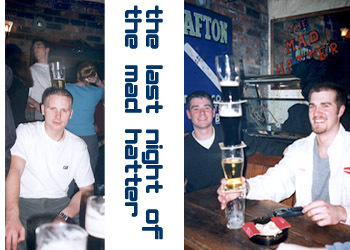 The last night at the Mad Hatter, Blackrock. Renovate. 1. Sully. 2. Two inocent by-standers. Farewell to the Hatter. We'll miss the Irish style healthy dinners. No more "Madness down the Hatter" for lunch. Ok, this has been going on long enough. Lotus Notes, I hate you! Those of you that are lucky enough to use a compact email package such as Windows Messaging, you don't know how cruel the world can seem when you use Lotus Notes. Lotus Notes is a heavy, memory hungry, sad attempt to integrate many organisation functions into one package. It has a web browser that no-one uses because it is too slow and you can't see what url you are at. It has a to-do list and a calendar/appointments on it too, which I don't use, but still have to load. Call me old fashioned, but I prefer to write my notes on paper, don't you? Lotus also manages email, which is where it really falls down. When I get a mail now, I have to try to decide if it is worth opening, because I don't have 30 seconds to spare opening stupid jokes and messages that are not for me. Like I get a mail and it says Subject: VSS; Content of email: You can use VSS again. I don't use VSS, so I guess any email with VSS in the subject is to be deleted. I just don't have time to check it. Now I could tell everyone I know to use the subject field for the message, but that's not the way email should work. Lotus Notes is a hopeless attempt to merge four packages that should be seperate for speed, reliability and personal preference. Lotus forces us to use three packages we don't need while not doing a good job of the email. Due to the continued overwhelming success of The Waltzer Experience, I have bought the domain name waltzer.net! This means much easier access for you. Soon you won't have to type in homepage.eircom.net /~waltzer /home.htm, you can just go waltzer.net and there you are. Beautiful. This is the final move for me now. I started out on Angelfire, then moved to Geocities for more memory, then I was on IOL, when they continued to charge for access while all other Irish companies were providing free net access I withdrew my account and my sites were on webjump. Then I moved here to Eircom, and in a couple of weeks I will be at my own domain, waltzer.net. I am going to add some more fun and original content to the site with the launch of waltzer.net, and I would be interested in hearing your suggestions. Yes, you! Just type them into this box, including your name or email if you like, and press send. Easy. HEAR ME NOW! Whenever I is bored in the office or at home, I always checks out NetBabyWorld. So what's da vibe? Well this is a wikkid site what has none other than six games on it. I likes to play da Ninja game, and it also has a racing game, bowling and mazes. Da graphics are big up retro, they looks like sometin' from DeluxPaint, but they is savage, innit! So check it out. Everyone here in da late office end massive is visiting dis rockin site. Bo!